One of the Nameless Ghouls from Ghost has confirmed the band are working on their third album and that it will surface in 2015. 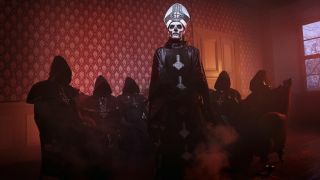 The follow-up to 2013’s Infestissumam comes on the heels of a 2014 battle between fans and non-fans of the masked Swedish outfit, with each side launching online petitions regarding the group’s status. The anti-Ghost contingent claims they are a “watered down version of Blue Oyster Cult” while the pro- side supports the band as part of the whole metal genre. Ultimately, Ghost laughed off both options and maintained their focus on touring. Infestissumam peaked at number 35 on the UK album charts while delivering the group a number one record in their Swedish homeland. Earlier this year one member said the band didn’t want to overstay their welcome but added they believed they had at least two more albums in them.